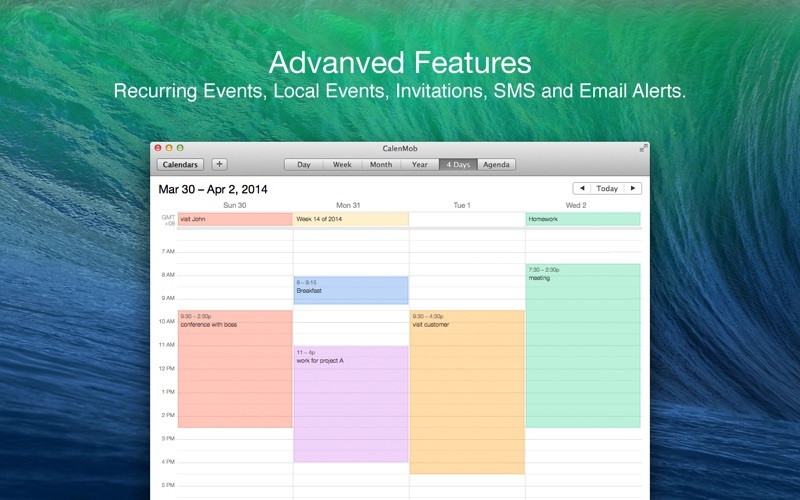 CalenMob is a native Google Calendar app with intuitive design. 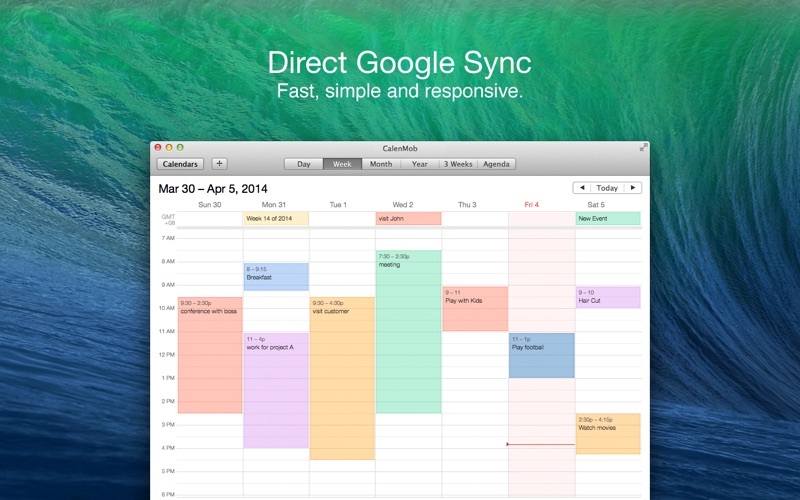 It inherits the simple and clean look of Google web calendar and makes it more accessible, responsive and reliable on your Mac. It can also be used with no Internet connection. All changes will be synced back to your Google account the next time you connected. MULTIPLE WAYS TO VIEW EVENTS CalenMob supports 6 standard views - day, week, month, 4-days, year and agenda. 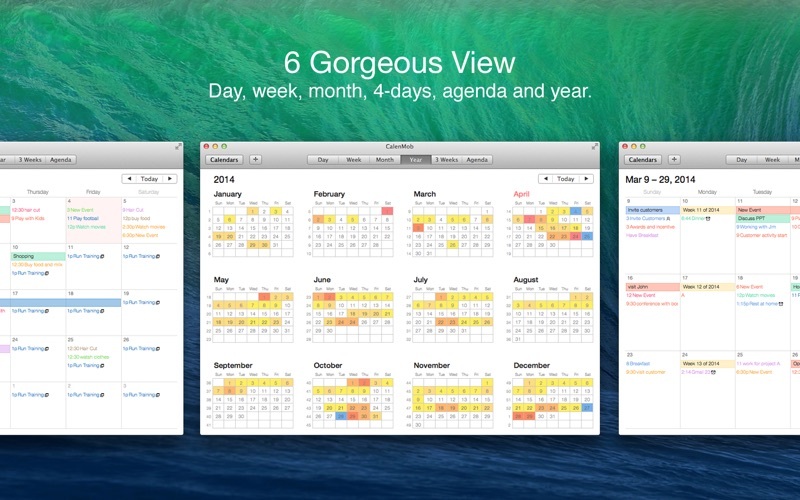 You can instantly switch views to discover events or find a time you're looking for. REAL-TIME SYNCHRONIZATION CalenMob automatically synchronize with your Google Calendar every time you open the app or after you make any changes to an event. WORKS OFFLINE You can still create, edit and delete events when you don't have an Internet connection. Calmob will cache your changes and sync back to your Google account next time you're online. ADVANCED REMINDER SYSTEM Never forget about a meeting! Like Google Calendar, CalenMob allows you to set reminders via push notification, SMS or email for all events. INVITE PEOPLE AND ACCEPT INVITATIONS With CalenMob, you can invite people and see their status. CalenMob also allows you to respond to an invitation (yes, no, maybe) if you received any invites. RECURRING EVENTS You can setup, view and modify recurring events. CalenMob fully supports all repeat patterns in Google Calendar. 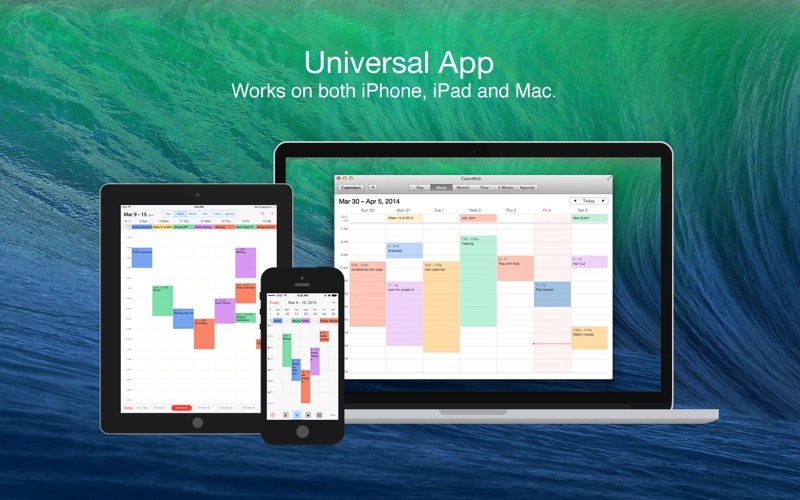 CALENDAR MANAGEMENT You can manage your Google Calendar with this app. You can create, edit and delete calendars anytime. All changes will be synced with your Google account. INTUITIVE GESTURES CalenMob supports multiple gestures that makes you easier to manage your events. You need a (free) Google Calendar account to use this app. If you don't have it, you can get one at www.google.com/calendar. SImply doesn’t work. Will not let you create an event from your desktop - a pop up says “You don’t have permission to add events to this calendar”. Support is non-existent. Nothing. And it cost almost 20 bucks. Apple shouldn’t allow crap like this to be sold. I bought this app because Apple’s Calendar.app does a bad job of interfacing with Google calendar (given that Apple and Google are competitors, there may be some deliberate non-interoperability being pushed from the Google side, hard to say). This app does a better job than Calendar.app, but that’s not really saying much. Modifications to calendar entries don’t always “stick”, some fields are inexplicably non-editable in Calenmob (I can’t create a new calendar event and then actually any guests to it, for example, and sometimes other fields like the repeat interval are read-only). In short, I find myself still using Google calendar’s web app pretty much all the time because this app just doesn’t let me do even the very basic things I need to do with Calendaring, much less leverage more advanced features of Google calendar. One supposes that Google calendar is simply a special magical unicorn that can and should only be used with Google’s own apps, because it’s just too hard to interface to it as a 3rd party (giving the Calenmob folks the benefit of the doubt). I have been pretty happy with the mobile version. So I paid $22 for the OSX version. Very disappointed. The sync with Google Calendar works fine. But you can’t add or edit an appointment (example 3 hour meeting) in the month view. You can only add or edit All Day events. No print function. No support available. There are no tutorials or help documentation on the Developer’s website. I sent an email to the address provided. No response. Update - Now after two weeks, the application has started crashing when I try to edit an event. Still no response on my email to “Support” regarding earlier questions. One star. And my money poorly managed. this is only for viewing and cannot edit anything. waste of $20!!! 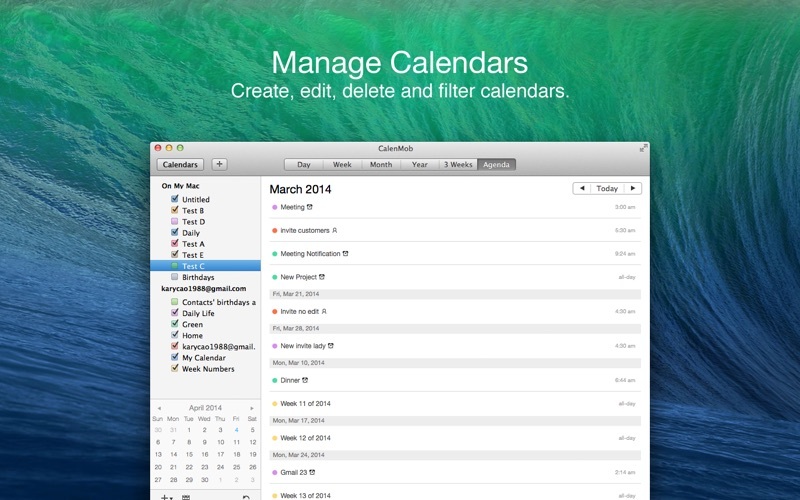 I like this app but the one thing I wish it had that iCal has is showing the current day on the icon in the dock. Every time I look down it says ’31’ in the corner and although I know it sounds stupid that I get confused by that from time to time, l do—especially when I know it’s close to the end of the month and all my days run into each other. It’s a very little thing that can make a big difference when you have little time to spare when making decisions on the fly. I find that if I am working on my computer I am usually not near a physical calendar and rely on that little icon more than I’d like. I hate having to open up the app just to verify what day/# of the week it is when making split second scheduling decisions with colleagues. I am not sure why this app seems to have become a forgotten project by the developer, but what was a useful app that had a decent sync with the mobile version has become so buggy that it is unusable. It could be that google has their own native calendar app now and it works pretty good, so why try? I just paid for desktop version to sync with my iOS and online versions and no calendar is showing up! Where is it? I gave it two days and don't know why there is no calendar showing. I loved this app until the most recent version. Now if I have a trip lasting three days, it appears on Calenmob as if it is lasting only two days. Not helpful!